Thanks God they finally realise that! In my province it was all about increasing membership no matter the quality of the candidates. Hi Eric and welcome to the Forum. 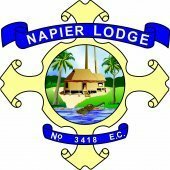 I would disagree that there is little benefit to visiting as an FC, which is why I try to organise a meeting to another Lodge as quickly as I can after our new boys have been through each. Aside from the usual fraternisation after the meeting it also gives you a fair chance to get your head properly around what you went through in your own degrees to witness someone else doing them. There's nothing Masonic about it but I think it may be the emblem of the anti-Trekkers What does the other side look like?